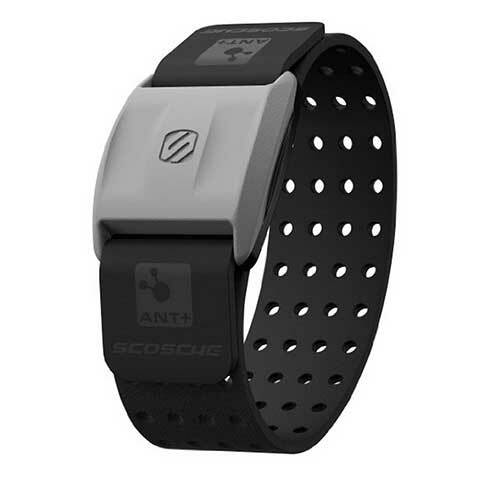 The Scosche Rhythm+ is an optical BLE/ANT+ armband heart rate monitor that’s highly recommended by DC Rainmaker. There are many posts around the Internet which claim that it doesn’t have updateable firmware, but that’s not always the case. Prior to firmware V2.5, the Rhythm+ had to be sent back to Scosche for firmware updates, but if you’re lucky to have firmware 2.5+ installed, you can update the firmware yourself with your phone and Scosche’s Fitness Utility. Tap the Firmware Update Start button, and the utility will update you to the latest firmware. I got a nice new feature when I upgraded mine to firmware 2.62. Now, after setting my HR Zone Min and HR Zone Max via the Fitness Utility, the LED on the Rhythm+ blinks blue when my HR is below HR Zone Min, purple when I’m between HR Zone Min & Max, and red when I’m above HR Zone Max. I guess if you only use ANT+, and want to save some battery life, you can turn off the BLE Radio as well, but I haven’t tried playing with any of the other functions yet, and I have no idea how you would turn BLE on again, since the app communicates via BLE. Update 2016-07-11: Reader Atle posted below that v2.62 adds another function for iOS users … click the button on the unit once to start/stop music, and double click to advance tracks in the playlist. I wonder if this works on Android, as well. Update 2017-06-16: As reader Occamsrazor states below, the Fitness Utility has been updated to Version 2. The description on iTunes shows that it has some new features, but it’s rather cryptic. I was able to use it to update my 2.62 FW to 3.01. You no longer have to press a firmware upgrade button. If your unit is eligible for updating the firmware, it will automatically prompt you when you connect your device. The new app has several new undocumented functions. I tried to enter my birthday, height, etc, but it doesn’t seem to work. If anyone figures out the advanced features, please post below. Apparently, it’s possible to record a workout in the band itself, and then export a CSV file, but I can’t get any of the functionality to work. Also, there are some reports that the new version is a lot less likely to brick your unit, but YMMV. It worked OK for me. Update 2018-01-09: 1) I’m not absolutely certain, but I feel that my Rhythm+ has gotten flaky since updating to v3.01 firmware. The heart rate is often very low or very high. I decided to try downgrading my firmware. If you are having issues, and want to try a different version of firmware, I have documented how to downgrade in a new article: HowTo: Downgrade Scosche Rhythm+ Firmware. 2) I was wrong above. You don’t need v2.62 firmware to get the feature that setting the Min & Max heart rates make your LED flash purple/blue/red when the heart rate is below Min/in between Min & Max/Max HR. v2.4 firmware actually supports that feature. There are 81 Comments to "HowTo: Upgrade Scosche Rhythm+ Firmware"
Only about 30sec or so. I suspect by the time you read this you will already have figured out that it was hung. I hope it didn’t brick yours. If so, I’m sure Scosche will fix it for you. I spoke with Scosche and your right on all counts. They said I would have to pay shipping back to them and they would pay shipping back to me. They said it would be processed in the same day they receive it. They informed me there are no changes to any of the algorithms within the device, just the ability to upgrade the firmware in the future. It was there opinion that if I was not having any issues that the upgrade was unnecessary and wouldn’t change anything. Same here as John Galea says above: I called tech support and they say the *only* difference is the ability to self-update and no other changes. When I read the above to the tech re: the original poster says “I got a nice new feature when I upgraded… Now, after setting my HR Zone Min and HR Zone Max via the Fitness Utility, the LED on the Rhythm+ blinks blue when my HR is below HR Zone Min, purple when I’m between HR Zone Min & Max, and red when I’m above HR Zone Max.” — the teach response was to again repeat there is no change from 2.4 (where I’m at today) to 2.62 other than the ability to self-upgrade firmware — but he did agree to email me info on how to send it in. Does your blink blue/purple/blue depending on below/in/above the HR zone min & max? Because mine definitely did not … in only blinked red until I upgraded the firmware. So the tech support guy is wrong. ok but how to turn it on ? The iOS works only with bluetooth? Very good point! I guess it’s not a good idea to turn it off, unless you are sure you only want to use ANT+ forever. There are another distinct difference between fw 2.62 and the older ones: The one with 2.62 works as a remote to my iPhone. Single click start/stop music and a double click goes forward on my playlist/podcast. This is not possible with the one with older fw. Cool! I didn’t even know it had that feature! Thanks for posting. Yikes! What version of firmware did you start from? Contact Scosche and they should be able to take care of it. No one else has complained of theirs getting bricked. Confimed, my RHYTHM+ bricked immediately after the firmware update. The update succeeded as expected (although it brought me from 3.0 to 2.62), a power-cycle succeeded as expected. I was able to take a quick HR measurement after the 2.62 update, as expected. The very next power-up, all I get is a blinking red/blue, alternating. Bricked. No combination of button press, or holding the button down for over 5 minutes seems to bring it back out of this mode. It’s dead after only 1 successful ride using it. Such a shame, but back into the box it goes, for return. Hmm, they must have different versions of the hardware. Mine is stuck at 2.62. Scosche should fix their software to check for compatibility. Sorry! Contact them and complain! Thanks for the feedback. I’ve moved the warning not to update newer firmware higher up in the article. There’s a new version “2” of the Fitness utility out today June 16, 2017 that says there’s a new firmware update that “supports multiple ANT+ operational modes”… if that means anything to anyone. Firmware update was unsuccessful for me, generated some error saying firmware image unsuccessfully received. Unit still works though. Curious what the actual changes are. The new firmware version installed on my Rhythm+ reported by the app after this update is 3.01, I don’t notice anything different from the prior version (2.62). The new version 2 app has a much more user friendly automatic firmware update “walk through”. It automatically compares your firmware with the latest when you start the app and asks if you want to update. It forces you to charge your Rhythm+ so have your charger handy, after charging turn on to connect the Rhythm+ to your phone, then it shows you a progress indicator as it updates the firmware (only takes a few seconds). The manual firmware update button is gone from the new app. Don’t notice any other differences in this app. to “Send Command” with a Turn Off button. I tried it and the Turn Off button actually turns off the Rhythm+ remotely from the phone. It took several seconds after clicking the button before it turned off. I deleted and reinstalled the app to clear all old data and noticed there’s a new bug now on the Parametric Data -> User Data page. I used to be able to enter and update my data. That’s no longer possible and all the info scrolls up one off the screen with each field clicked. I have written to Scosche. Also, does anyone have any idea what the new functionality actually means? It might be failing due to the version you’re upgrading from, maybe? What version is currently installed? Played around with it a little more today on a 4 mile walk. Had iSmoothrun running to log the workout and also tried the Walking Calibrate and it concluded with a calibration number but I have no idea how that should be used or is used. Wanted to report here that iSmoothrun wound up logging lots of crazy 4 digit heart rates while health kit had mostly normal heart rate recorded but there were a few crazy 4 digit heart rates in that data too. This may be related to doing the calibration during the active workout. Don’t think I’ll play with this app anymore. About Rhythm+: what are the differences between firmware 2.6.2 and 3.01? Is it safe to upgrade with Fitness Utility 2? 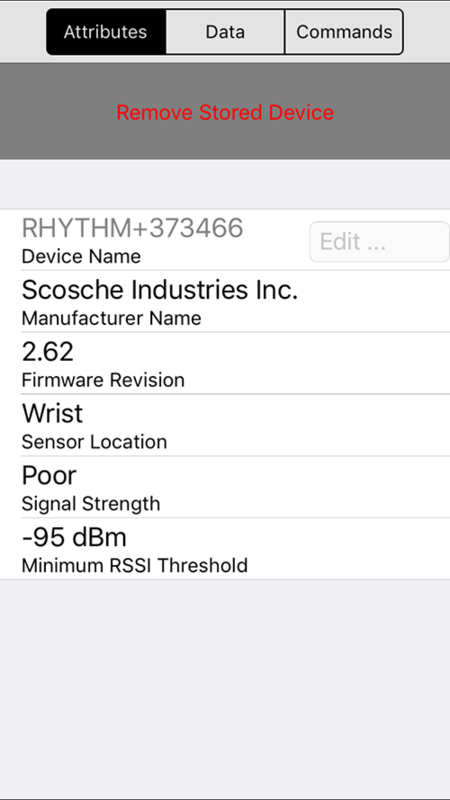 The latest firmware provides the RHYTHM+ with serial numbers within the app since our latest units are coming with serial numbers laser engraved onto the sensor itself. These serial numbers don’t apply to single end consumer users, but are meant for larger workout groups and gyms like Orange Theory who can monitor several users and RHYTHM+ devices at one time using their software. Upgrading the firmware on the RHYTHM+ won’t hurt it though, and yes it can be updated using the Fitness Utility App. We don’t have documentation on the parameters of the app since it’s main intention is only for monitoring battery level of the RHYTHM+ and firmware updates. I would recommend not to upgrade yet to V3.01. I upgraded from 2.62 to 3.01 since I assumed the issues were over. I’m using iSmoothRun and my workaround is to stop (not just pause, really stop and save) the training and in the log list, then open it and resume it (continue with the “play” symbol >). I sent an email to the developer of iSmoothRun with more details and asking if he could “ignore” those spikes that seem to make the HR values hang. The developer of iSmoothRun recommended this solution which seems to work for me! This worked for me today. Not one issue of a heart rate reading going through the roof. I wouldn’t have thought to configure it this way. Thanks for posting. The team of iSmoothRun was very cooperative and helped me gathering some logs so they could find the issue. Apparently the Scosche sometimes sends a wrong value (16 bit vs 8 bit). That caused the heart rate module to crash. In one of the next versions of iSmoothRun, they will update that heart rate module of the app, so it doesn’t crash when Scosche sends unexpected data. That should fix the problem and you should then normally be able to use the “normal” BT Sensor again (which seems to be preferred). Omg this new issue with iSmoothRun was driving me insane and this fix worked for me too. Thank so much! This Wahoo workaround was working for me but I just upgraded to a phone with iOS 11 and now iSmoothRun won’t let me pair the Scosche as a Wahoo sensor – selecting “Add ANT+/BT Heart Rate” brings up a message that says “Please insert the Fisica sensor key.” If anyone has any insight I’d love to hear it. Thanks! I was required by customer support to downgrade my firmware from 2.62 to a lower version to allow the Cateye Steath50 bike computer to pair. The Stealth will not respond to a 6 digit coded device. I wonder if the latest 3.01 version will fix this issue? I just recently got a Rhythm+ and trying to update the firmware through the IOS app fails at 0% with the message “Firmware Update Failed”. There is no other message except for starting over. The current firmware displayed is 3.0. I’ve used the unit a few times while and running with iSmoothRun and each time the app has logs an extremely high heart rate reading in the thousands with the highest being 29404 bpm. After that the app cannot recover the heart rate and would continually display the high reading. So far I’ve been totally unimpressed and am thinking I will have to return it despite all the good reviews I’ve seen about it. I contacted Scosche support and they had me test with the Wahoo Fitness apps as that is there supported. I’ve been on a few runs using Wahoo and there hasn’t been any issues with the heart rate reading spiking into 4 digit territory. I guess I’ll have to be looking for a new app as iSmoothRun does not play nice with the Rhythm+. It’s too bad as iSmoothRun is a great app except for this. I had the exact same. I contacted Scosche support but no answer. I tested with the Wahoo app since I knew it could monitor HR and saw no spikes. Problems started when I upgraded from 2.62 to 3.01 (see my post above for more details). So apparently there is a bug in Scosche and some apps have anticipated that bug, some haven’t. If you read my update above, you’ll see that iSmoothRun will probably be able to handle this situation in the future too (without the need to switch to the Wahoo library in the settings). but now it acts as a footpod too ! Can I disable it ? ?? I have not seen this. How are you seeing the other functions? Hmm, that’s interesting! I have a FR235, and it doesn’t show a footpod when I connect. But I think you might be right that it has an accelerometer, since the Fitness Utility app that we use to load the firmware has walking/running calibration. All undocumented. I suggest reaching out to Scosche. Please report back here if you find out anything. Does anyone know how to downgrade the firmware from 3.01 to 2.6.2? It’s been unusable for me after the upgrade. Ismoothrun reports bad numbers even after trying the workaround and using the latest version. I even spotted a very high heart rate reading (40,000) using the workout app on my Apple Watch when paired with the scoche. I just want to downgrade to when it was working fine. Don’t care for the new features. Hello all. I found this page searching for an answer. I got the rhythm + for Christmas and I’ve used it on about 8 rides. I use Fitiv Pulse as my primary fitness app, and backup to Cyclemeter and Strava. Both Fitiv and Strava filter out the spikes, however Cyclemeter, Health, and Activity do not. I get large spikes up to a maximum of over 58,000 bpm. Mine came with 3.01. I downloaded their Fitness app and about the only thing that works is the battery level, I can’t seem to do anything else with it. It really is a pitiful app. I’ve emailed them twice with no response. Is there any way to go back to 2.62? I downgraded my firmware with the help of Scosche support. Here are the instructions. I put the firmware file on my google drive at https://drive.google.com/file/d/1ILxWLKd1qEN7ZW1ahYUrKJQFJQZmz_EG/view?usp=sharing. It is a goofy name (what Scosche named it) ending in “.hex”. You must use an Apple device for this to work! 4) Select the commands Tab and scroll to the very bottom. You will see Firmware update and a “Start” button. 5) Once you press “Start” the update will begin. 7) Be sure to kill the Fitness Utility App when you are done to disconnect from the armband and initiate the connection with your watch. BTW this firmware is version 2.4. You might contact Scosche support if you need/want something else. I found them responsive. Thank you!!! I’ve been trying to get them to help me downgrade mine, but no response yet. Hmm. I’m using the latest Fitness Utility, and I opened the hex file (“copy to Fitness Utility”), but there’s no Firmware update selection in the bottom of the Commands tab. The last entry is just like before, Send Command / Turn off. What am I doing wrong? It was a while ago when I did this. Is there an option other than “copy to Fitness Utility”? You are using an IOS device…right? Beyond this I have no suggestions. Yes, I’m using the latest iPhone app. Crap, I don’t have a copy of the old app. I erased it a few weeks ago. The V2 app doesn’t have a firmware button, because it auto scans. Do you still have the app that works on your phone? Maybe there is a way to name the file so the new program thinks it is a higher version?? Probably it is a standard name and the contents indicate the version, so guessing that won’t work. Gonna have to rely on Scosche I guess. damonm@scosche.com at 805-486-4450 x​120 Office was my contact back on Dec-6-2016. OK, I contacted Scosche tech support via live chat (I was never able to get any response via e-mail). Unfortunately, the firmware downgrade method posted by Ronald Rossi above doesn’t work with the V2 version of Fitness Utility, since they removed the Firmware Update button. Does anyone have a copy of the V1.x Fitness Utility on their iOS device? If so, could you please back it up to your computer via iTunes, copy the Fitness Utility.ipa file, and send it to me? I think if we can get a copy of the old program, we can downgrade the firmware ourselves. Otherwise, Scosche will downgrade your firmware for you if you send your unit back to them. Scosche has just announced a new armband heart rate monitor with a new application. I find the design rather ugly but evolutions are real. I really didn’t want to send mine back to Scosche to do the firmware downgrade, so I spent the afternoon trying to hunt down an older version of Fitness Utility to downgrade the firmware. Woohoo! I was able to dig up v1.4.1, and used it to downgrade mine from firmware 3.01 to 2.62!!! I will document downgrade procedure in a future blog post. I hear that there is firmware 3.30. Can anyone confirm? Did someone try it? I have downgraded back to 2.62 so I prefer to wait and see. Hey, is the only way to get v3.3 or newer, to send-it-in? That’s such a PITA, I don’t want to do that, I doubt Scosche Australia will even do that anyway. Some folks have had luck, but I bet that’s US only. When they do the fw update, do they give you access to the upcoming totally revamped app too? It’d make sense, using the old crappy one (currently v3 for iOS11) with the new beta fw would be dumb. New iOS app is now out! Updating my rhythm+ to 3.4 right now. It’s under Scosche Rhythm Sync in App Store. All good. Few rides in zwift on new firmware 3.4. No more annoying drop outs or sketchy HR numbers on bluetooth. Seems pretty solid and all is good, but still annoyed at the months of radio silence from Scosche after the bad firmware. Actually bought a Wahoo Tickr while waiting on the update. Did anybody else already upgrade? Experience in combination with iSmoothRun? Peter, I’m using the 3.4 Rhythm+ firmware upgrade with iSmoothRun and Bluetooth on an iPhone 7+. After a few hours of testing over a few days I can say it is better, no more high heart rates in the 4 and 5 digit range BUT iSmoothRun still has a problem with occasionally dropping down to 1/2 heart rate for one or 2 seconds. For example HR is steady around 82 BPM then 2 readings of 41 for 2 seconds then back to steady at 82 BPM. Bluetooth Pairing the Rhythm+ is also still a little problematic. I have to open the new Scosche Rhythm Sync app before turning on the Rhythm+ or else the Rhythm Sync app doesn’t show the Rhythm+ at all. Seems like the new Rhythm Sync app was made mostly to support the upcoming Rhythm24 device. I’d never buy another Scosche product after my year+ bad experience with the Rhythm+. 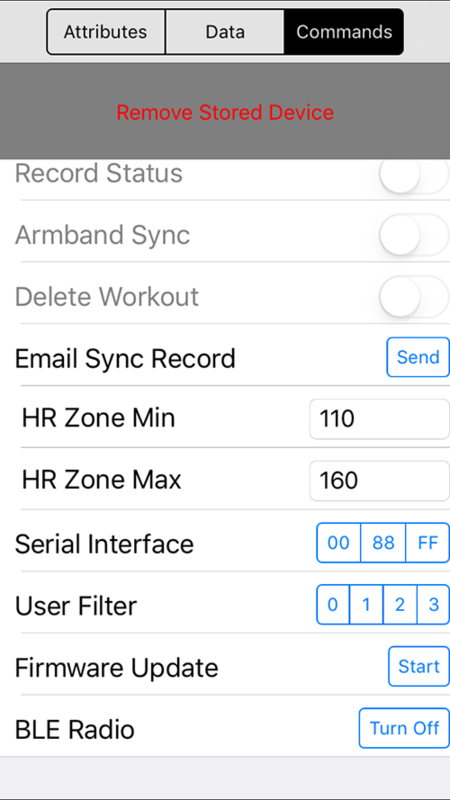 BTW If I simultaneously use the Rhythm Sync app to log HR into the health app it does not show those 1/2 heart rate readings as long as I don’t log HR using iSmoothRun. I haven’t reported any of this to the iSmothRun developer(s), but I have contacted them about other things in the past and they have always offered excellent support. Tried ten times, no success 🙁 Do you have any idea? Never will touch this product again I am afraid. Looks like they added Software Update to the Android App. But it timed out for me trying to go from 3.01-3.4 (it’s not bricked – just connect to charger and it’ll reset. Or try the method Scosche recommends – basically drain the battery (https://www.youtube.com/watch?v=TnYJxoe60M8). But using a friend’s iPhone, upgraded like a champ. Have only seen dropout once on 3.01 in 6 months or so of use. We’ll see how 3.4 does.